Recent work in my group has largely been directed towards the effects of host-guest binding on organic reactivity. We are particularly interested in Transition State Stabilization arising from the binding of transition states to "catalysts", such as dendrimers, protons, metal ions, protons, micelles, cyclodextrins and other molecular hosts. In effect, our research is concerned with the origins of Supramolecular Catalysis. Cyclodextrins (CDs) are roughly bucket-shaped, cyclic macromolecules made up from several D-glucose units, linked together 1,4 in a toroidal fashion (see left and below). They are generated during the microbial degradation of starch. In a blatant attempt to appear trendy, we frequently made use of the term "Nanobuckets" for cyclodextrins, but much to our annoyance and chagrin the term never caught on. Many aspects of Cyclodextrin Chemistry were reviewed in several articles in a special issue of Chemical Reviews, 1998, 98 (#5), 1741-2076. The three most common CDs are composed of 6, 7, and 8 glucose units. They are generally referred to as α-cyclodextrin, β-cyclodextrin and γ-cyclodextrin (α-CD, β -CD and γ-CD), respectively. The Figures above and to the right show the structure of α-cyclodextrin. The cavity opening surrounded by secondary OHs (those at glucose positions C-2 and C-3) is wider than that defined by the primary OHs (those at C-6). Hence the CDs are roughly bucket-shaped. The cavities of CDs are relatively apolar, which allows them to include the hydrophobic parts of molecular species of appropriate shape and size. As a consequence, CDs form host-guest complexes - usually inclusion compounds - with a wide variety of guests both in the solid state and in solution, but especially and most importantly in aqueous solution. Most often, these complexes are binary, with a host:guest ratio of 1:1, but various other stoichiometries are known. Ternary complexes are known, also. As a result of host-guest complexation, cyclodextrins can alter the reactivity of included molecules in a variety of ways. For examples, consult the reviews: Carbohydr. Res., 1989, 192, 181; Adv.Phys. Org. Chem., 1994, 29, 1; Chem. Rev., 1998, 98, 1997; Chem. Rev., 1998, 98, 2013. Depending on the structure of the reactants and the reaction, complexation of one (or more) of the reactants by a cyclodextrin (CD) may lead to rate acceleration, no effect, or rate retardation. Which of these effects occurs depends on whether the transition state of the reaction is bound more strongly, the same, or less strongly than the initial state (See: Adv. Phys. Org. Chem., 1994, 29, 1). Following the pioneering work of Myron Bender and his coworkers, many kinetic studies - by us and by others - have shown that cyclodextrins can speed up (or slow down) the cleavage of various types of ester, especially aryl alkanoates (RCOOAr), in basic aqueous solution. The size of the rate acceleration (or rate retardation) depends on the nature and position of substituents on the aryl ring, the nature and length of the acyl group (e.g. the Figure), and on the identity of the CD. For examples, see: J. Org. Chem., 1988, 53, 1837; Carbohydr. Res., 1989, 192, 181-196. J. Am. Chem. Soc., 1992, 114, 620; J. Chem. Soc. Perkin Trans., 2, 1994, 2191; J. Chem. Soc. Perkin Trans. 2, 1994, 715; Adv. Phys. Org. Chem., 1994, 29, 1; J. Chem. Soc. Perkin Trans. 2, 1995, 1237. In our earlier studies of ester cleavage we found evidence of reaction involving two CD molecules (e.g. J. Am. Chem. Soc., 1992, 114, 620; J. Chem. Soc. Perkin Trans. 2, 1994, 715), and later on we demonstrated that ester cleavage can be catalyzed by two different CDssimultaneously. 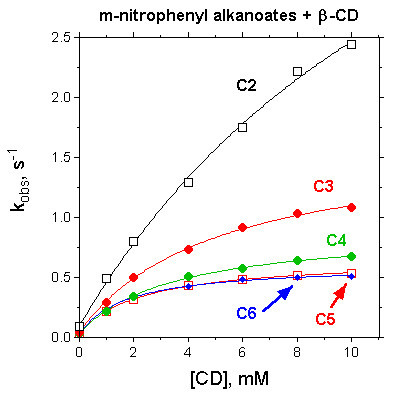 In a basic aqueous buffer, p-nitrophenyl octanoate is cleaved more rapidly in mixtures of "dimethyl-β-cyclodextrin" (dime-β-CD) and γ-cyclodextrin (γ-CD) than is attributable to the independent actions of the two different CDs. The additional reactivity is accounted for by a third order process involving the ester and one molecule of each of the two different CDs. Transition state binding parameters are consistent with the inclusion of the acyl group of the ester in the dime-β-CD and the aryloxy group in the γ-CD. See Figure at left. (J.B. Giorgi and OST, J. Am. Chem. Soc., 1995, 117, 3633. Likewise, the anions of α-CD and β-CD catalyze the deprotonation of β-keto esters, RCOCH2COOR'. For the derivatives studied, binding of the alkoxyl group (O-R') appears to be of more significance than that of the acyl group (R-CO) both in the initial state and in the transition state (OST, N.R. Iyengar and B.K.Takasaki, Can. J. Chem., 1993, 71, 2139). Cyclodextrins retard or inhibit many reactions of included guests and this aspect gives rise to their use as preservatives, stabilisers, etc. For example, cyclodextrins retard the acid-catalyzed hydrolysis of aromatic acetals. We have looked at XPhCH(OR)2 , PhCMe(OMe)2 , and the orthobenzoate ester, PhC(OMe)3 . The inhibitory effect is greatest with β-CD (see Figure), which binds all of these substrates quite strongly. These reactions can be used as probes of cyclodextrin-guest binding by measuring the ability of guests to attenuate or "inhibit" the "inhibition kinetics" (the I2K method !) (OST, A.A. Fedortchenko and P. Lim Soo, J.C.S. Perkin Trans. 2, 1998, 123-128 and OST, S.M.I. Hussein, I.E. Turner and O.J. Yazbeck, Can. J. Chem., 2000, 78, 436). The "I2K method" has also been used to monitor the binding of simple sugars to β-CD. Studies of the effects of cyclodextrins on reactions of non-binding nucleophiles with p-nitrophenyl alkanoate esters (OST & T.A. Gadosy, J.C.S. Perkin Trans. 2, 1994, 2307-2311; J.C.S. Perkin Trans. 2, 1995, 71-76) established that the CD-bound esters have similar or slightly reduced reactivities, compared to the free esters. With alkanoate esters which bind to CDs through their acyl chains, the magnitude of the effects depend on the ester chain length. A later study of the effect of β-cyclodextrin on the reaction of α-amino acid anions with p-nitrophenyl acetate (and the hexanoate) showed modest catalysis of the reactions of those nucleophiles that bind appreciably to the CD (OST, T.A. Gadosy and J.B. Giorgi, Can. J. Chem., 1997, 75, 83-91). Subsequently, we studied in detail the effects of four cyclodextrins on the aminolysis of p-nitrophenyl alkanoates by various alkylamines. In many cases involving β-CD or γ-CD, but not the smaller α-CD, and particularly for "long" n-alkylamines, there is appreciable catalysis by the CD. (T.A. Gadosy, M.J. Boyd and OST, J. Org. Chem., 2000, 65, 6789-6889). This catalysis appears to arise from reaction of the CD-bound amine with the free ester (see Figure at right), but in some cases there must be additional stabilizing interactions between the ester aryl group with the CD since there are significant differences between the behaviour of p-nitrophenyl esters and naphthyl esters. In particular, the aminolysis of naphthyl acetates shows more substantial catalysis by β-CD (OST & M.J. Boyd, Can. J. Chem., 1999, 77, 950-959. Our most recent work in this area entailed looking at the effects of CDs on the aminolysis of 4-acetoxybenzoate ion (4-ABA). This ester binds only weakly to α-CD and not at all to β-CD and γ-CD. Correspondingly, aminolysis is slightly retarded by α-CD and modestly catalyzed by β-CD and γ-CD. Transition state binding correlates strongly with amine binding in the initial state, fully consistent with reaction mode shown in the Figure above.A thesis (D. Ghadiali, M.Sc.) has been completed; a manuscript is in preparation. Included in this research, which has been published in J. Chem. Soc. Perkin Trans. 2, 1997, 2609-2619, were studies of the ring-opening of Vitamin B1(Thiamine). Professor Kathy Darvesh, also of Mount St. Vincent U., and coworkers have carried out theoretical (ab initio) studies of this type of ring-opening. See article # 13 (OT-313C) in Arkivoc, 2001 (xii). We are also interested in reactions catalyzed or mediated by micelles. Thiolysis of p-nitrophenyl alkanoate esters by the anions of mercaptoethanol (ME), mercaptoacetic acid (MAA), 3-mercaptopropionic acid (MPA), and cysteine (CYST), as well as cleavage by the anion of trifluoroethanol (TFE), are all strongly catalyzed by CTAB micelles in aqueous solution - much more so than is ester cleavage by hydroxide ion or the anion of glycine. The kinetics of ester cleavage are analyzed to give rate constants for nucleophilic anion attack on the esters in the aqueous phase (kN) and the micellar phase (kcN), and dissociation constants (KS) for binding of the esters to the micelles. From these constants we have deduced constants for dissociation of the cleavage transition states bound to the micelles, KTS = kNKS/kcN (cf. Adv. Phys. Org. Chem., 1994, 29, 1). Transition state binding (pKTS) and substrate binding (pKS) are strongly correlated with each other with a slope of ONE because they show the same sensitivity to ester chain length (see Figure above). There is a constant difference between pKTS and pKS them for each nucleophile and so the catalytic ratios (kcN/kN = KS/KTS) are independent of the ester chain. Similar behaviour was found earlier for ester cleavage by hydroxide ion in CTAB micelles (OST & A.A. Fedortchenko, Can. J. Chem., 1997, 75, 1434-1438). It is argued that the ratios kcN/kN vary appreciably with the nucleophiles because of their different propensities to exchange between the aqueous medium and the Stern layer of the CTAB micelles (OST & O.J. Yazbeck, Can. J. Chem., 2000, 78, 1100-1108). Recently, we have studied the effects of CTAB micelles on ester aminolysis: specifically the cleavage by p-nitrophenyl (pNP) esters by alkyl- amines in water with a constant "ionic atmosphere". The "efficiency" of CTAB-mediated aminolysis of pNP acetate increases systematically with the amine chain length, from a 4-fold retardation (for n-PrNH2) to 70-fold catalysis (for n-OctNH2), and it correlates strongly with amine hydrophobicity, expressed by octanol-water partition coefficients (Fig. A). Also, the strength of transition state binding increases with amine chain length, and it is larger for the pNP hexanoate than for the acetate, suggesting additional (hydrophobic) binding for the hexanoate ester. For the ester series: pNP acetate to decanoate, reacting with n-hexylamine, the catalytic "efficiency" decreases with ester chain length, indicating that the effects of the ester and amine chains are not independent. This decrease in catalysis arises because the chain length dependences of transition state binding and substrate binding are not parallel (Fig. B), unlike the situation with hydrolysis and thiolysis (see Figure above). Normally, the "concentration effect" arising from partitioning of the reactants into the micelles is sufficient to explain micellar catalysis, but here. In the present case, the rate of amine attack in the Stern layer of CTAB is moderated by strong hydrophobic interactions of the amine and ester with the micellar core when both have long alkyl chains. Acknowledgements: I am extremely grateful to all my coworkers and collaborators whose names appear in the abstracts, list of publications, or on the group webpage. Without their efforts, most of the research could not have been carried out. Our work has been made possible by operating grants, equipment grants, and scholarships from the Natural Sciences and Engineering Research Council of Canada (NSERC) and by the support of Concordia University. We are also grateful to Wacker Biochem (Wacker-Chemie) for the gift of some Cyclodextrins.